If you’ve ever driven into the sunset with a dirty windshield or taken a drive after a snowstorm, your windshield caked with salt, you can probably relate to one of astronomers’ ongoing frustrations: seeing through dust. Cosmic dust, which collects in galaxies in loose fogs or thick clouds, has often plagued astronomers. The tiny grains, each 10,000 times smaller than the eye of a needle, absorb light, scatter it, or change change its wavelength so it’s invisible to the eye. In doing so, dust steals some of the few clues we have to understand the nature of the universe. But astronomers are discovering that dust plays important roles in both creating our universe and helping us understand it. It plants the seeds for stars, planets, and life as we know it. In the past two decades, astronomers studying dust have pulled back the curtain on important pieces of the universe that were hiding in plain sight. The more we learn about dust, the more we realize that it is part of the puzzle—not the rascal hiding the puzzle pieces. In the clouds of swirling gas that produce stars and planets, dust serves as a wingman for hydrogen. As a cloud condenses under its own gravity, star formation begins when hydrogen atoms meet and form molecules. But the compressing gas raises temperatures to the point where hydrogen begins whizzing around too fast to form bonds. It’s easier for the atoms to latch onto a piece of relatively big, slow dust. There, on the dust’s surface, two atoms can form a bond, making forming the first building blocks of a star. But dust is more than a matchmaker. As nearby stars blaze hot and bright in the ultraviolet, clouds of dust can act as a shield, sheltering stars-to-be from the barrage of radiation, which can break their chemical bonds and thwart their path to stardom. The stars and dust clouds of the Milk Way. No image credit. When the obstacles are finally overcome, a new star blossoms out of a cloud. Some of the remaining dust and gas begins to spin around the star and flatten into a disk. Specks of dust collide, and as their gravity increases, they pull more dust and gas onto their surface, accreting material. Over time, they become pebbles, then boulders and, sometimes, a few million years later, planets. Xuening Bai, a research associate at the Harvard Center for Astrophysics, studies the processes that create planets and the stuff of life. Without dust, he says, the world would be a different place. Indeed, most of what we see in space—not to mention all that we are, all that we eat, all that we breathe—owes its existence, in some way, to a grain of dust that formed the seed of a star or planet. But despite its fundamental importance, astronomers have only begun to understand what dust really is and how it affects the way we see the universe. Dust itself is a mishmash of mostly carbon-based ashes cast off from dying stars. “It’s a catch-all term for what we would refer to on Earth as soot,” says Caitlin Casey, an astronomer at the University of Texas at Austin. Until recently, this “soot” was poorly understood. For centuries, the practice of astronomy was limited to what people could observe at visible wavelengths—in other words, what people could actually see. Dust absorbs light that can be seen by the naked eye and re-emits it at longer, infrared wavelengths, which are invisible to us. As a result, for most of history, dust was seen only as dark blobs, riddling galaxies with holes. Then, in the 1960s, the first infrared telescopes pioneered the study of dust emissions. But these telescopes were not able to detect all radiation from dust. Very distant galaxies, such as the ones Casey studies some 10 billion light-years away, are receding so quickly that the light re-emitted by their dust gets stretched, shifting its wavelength into the submillimeter range and making the galaxies practically invisible, even in infrared telescopes. It wasn’t until 1998 that a group of astronomers in Mauna Kea, Hawaii, pointed a submillimeter telescope at a blank field of sky and made a discovery that rocked the field. A few years earlier, the Hubble Space Telescope had revealed that this blank sky was swarming with distant galaxies, but now, an entirely new population of galaxies lit up in submillimeter wavelengths. It was like turning on a light in a room where astronomers had fumbled in the dark for centuries. Galaxies glowed with dust, and the earliest, most distant galaxies, showed the most dust of all. Submillimeter wavelengths were the last piece of the electromagnetic spectrum to be observed by astronomers, so in some ways, the 1998 discovery seemed to complete a picture of the universe. Large swaths of the sky were now imaged at every wavelength. Dust, the quiet catalyst behind star formation, had been unmasked. But in another way, astronomers had merely stumbled upon more pieces to a puzzle they thought they had completed. Because if dust comes from stars, the universe should get dustier the more stars have lived and died. What business did the earliest galaxies have being so dusty? The universe has been around for nearly 14 billion years, but most of these dusty galaxies formed when the universe was a tender 2 or 3 billion years old. By then, only a few generations of stars had ever existed. So where did all that dust come from? Desika Narayanan, an astronomer at the University of Florida, probes for answers by developing numerical simulations to model the early universe. He says that one clue lies in the earliest galaxies, which were probably ungainly, messy galaxies a far cry from the elegant spiral that is our Milky Way. Galaxies like ours pop out a star about once or twice a year. But these old, dusty galaxies were firecrackers, bursting with up to 1,000 to 2,000 new stars a year. As the first stars died, dust billowed from them and filled the galaxy—perhaps enough to account for the levels of dust seen today. But telescope data can only confirm so much. In the short lifetime of submillimeter astronomy, Narayanan says, telescope sensitivity has drastically improved, outpacing even camera phone technology, which has raced from blurry images taken by flip-phones to the latest, sharpest shots on iPhones in roughly the same period. Still, even the greatest telescopes strain against the vastness of the universe. They have to be extremely large to detect and resolve light from the most distant galaxies. At 15 meters in diameter, the world’s largest submillimeter dish belongs to the James Clerk Maxwell Telescope at the summit of Mauna Kea, Hawaii. It was the first telescope to detect these galaxies in 1998. In Chile, the Atacama Large Millimeter Array/Submillimeter Array, or ALMA, is made up of 66 dishes that can be arranged to span nearly 10 miles in an attempt to resolve the universe’s faintest, most distant galaxies. It’s no coincidence that both of these observatories were built in extreme environments, both well above 10,000 feet and in dry places where the air is thin. Water vapor in the air soaks up most of the infrared radiation passing through it that’s so critical to observing dust. Meanwhile, the Earth itself radiates enthusiastically in the infrared, creating a noisy background for any signal that does get through. “Doing infrared astronomy from the ground is like trying to observe a star in the daylight out of a telescope made of light bulbs,” George Rieke, an infrared astronomer, once said. For now, this difficulty has left some mysteries intact. Although astronomers are better able to observe galaxies and create simulations, some galaxies remain too old and too dusty to fit into existing models. The size, peculiar structure, and dustiness of early galaxies is not fully explained. The next surge in science, expected to help explain some of the mysteries surrounding dusty, star-forming galaxies, will come from the James Webb Space Telescope, a massive instrument with a six-and-a-half-meter dish—a piece of highly polished metal as wide as a giraffe is tall—set to for launch in 2018. Free from the interfering atmosphere, this telescope will peer into the dusty edges of space in finer detail than any other telescope. Narayanan says that the astronomy community is excited for these new measurements, and expect it will reveal new avenues for exploration. “Immediately, you start to open up as many questions as you think you’re going to answer,” he says. On July 31, astronomers will meet in Durham, U.K., to celebrate the 20th anniversary of the discovery of dusty star-forming galaxies and share what they have learned over the last two decades. But the elusiveness of hard data has left many questions about ancient dusty galaxies still open for debate. “I suspect we’re still going to walk away from this meeting saying, ‘Theorists still haven’t figured out where they come from,’” Narayanan says. 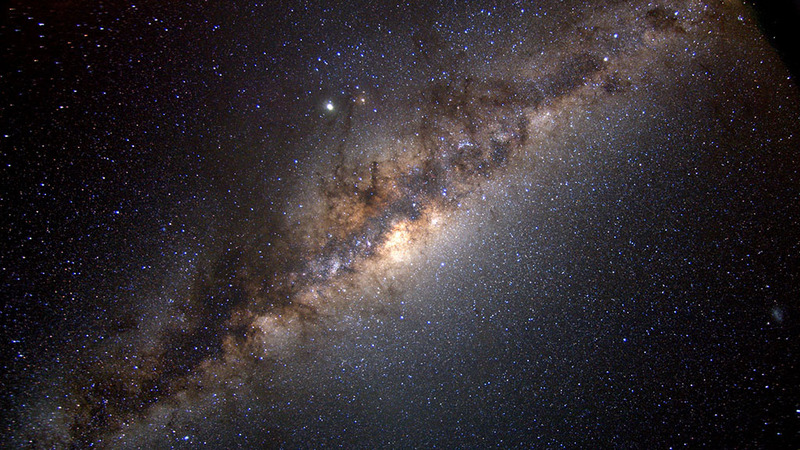 Despite all the research on dust, it is only a small fraction of the universe. Even in moderately dusty galaxies like our own, dust accounts for less than 1% of the mass. Yet its ability to transform the light passing through it completely changes the way we see the universe.